The Shakers designed chairs in a way that was relevant to their way of life. Not only are our homes getting smaller today, restaurants, bars and cafes are too. "What is the smallest functional chair, that could still be comfortable to sit on?" was my question. I designed a three legged chair with a short backrest and a seat shape inspired by the Shaker stove that can be hung on a wall mounted peg rail. The Shakers innovated with materials and craft techniques to create storage baskets and boxes which were used to store everyday items. This set of leather baskets uses a six-leaf pattern and a simple fold and snap system that enables them to be packed completely flat and comes in Red, Blue and Tan colored Napa leather. Reinterpreting the Shaker peg rail, this version takes inspiration from the domino joints that are commonly used in wood working today. The proportion of the domino gives it its strength. A ledge enables storage of mail and also acts as as a spacer between the wall - which is useful when hanging large coats. The Shakers' work is often characterized by their utility and joinery. 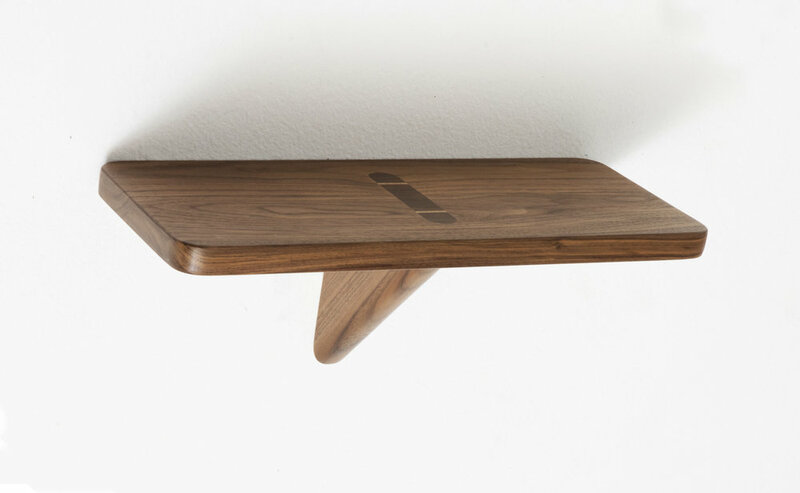 This wall mounted shelf is an exercise in both. 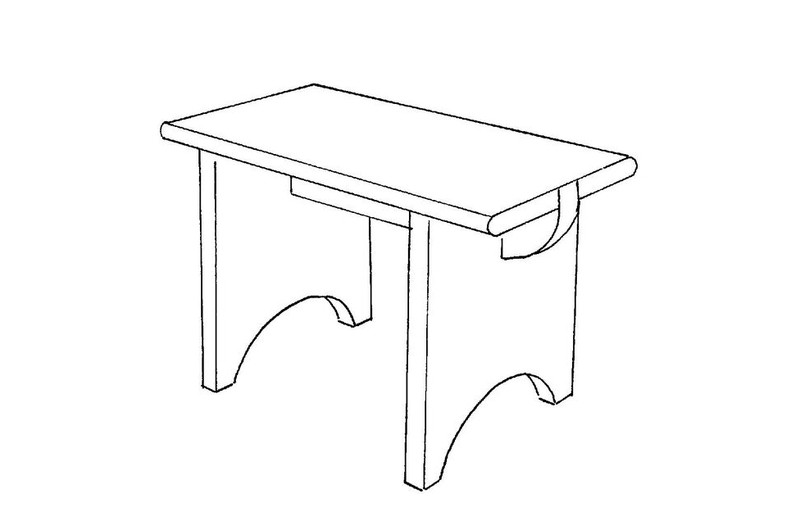 The wedged tenon under the shelf ensures that it will never sag. A clothes and accessories valet inspired by the utilitarian spirit of Shaker furniture. Its form is borrowed from a ladder and its fully collapsible and easy to assemble. A molded leather box to contain jewelery or precious small objects. Exuding the simplicity and functionality of Shaker bent wood boxes. 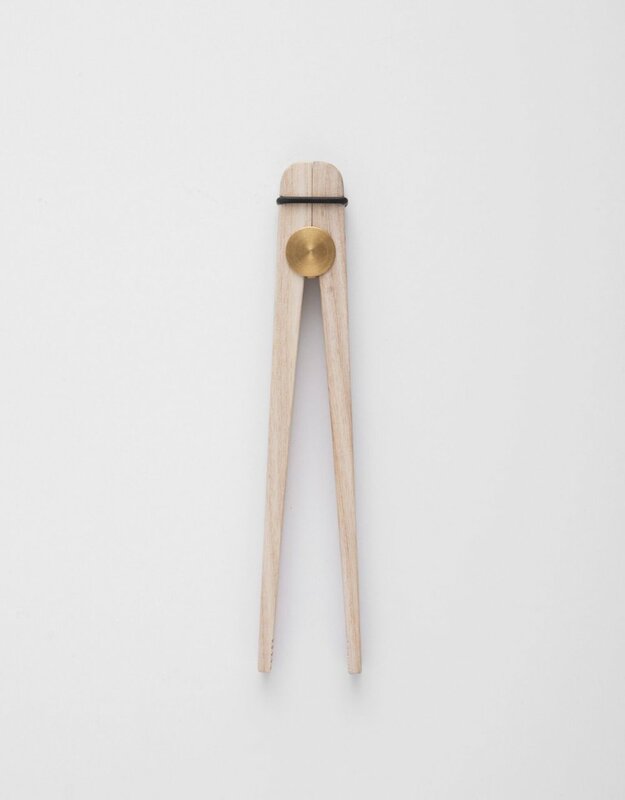 Invented by the Shaker community in the 1700s, clothes pegs acted as an essential tool to keep one's laundry firmly attached to the drying line. The more commonly known clothes peg design, two interlocking prongs wedged between a small spring, was not developed until more than a century later. To this day the clothes peg design has not been iterated on except to include plastic in its materials list. This clothes peg's modified form enhances its original singular purpose by adding an additional function in that it can be used to display pictures, acting as an informal frame. A folding chair originates from the necessity for impermanent seating for special occasions. While impermanence often gets a bad name in design, when related to experiences it takes on a more nuanced meaning. Folding chairs are often used for some of the most significant moments in life, whether that be a graduation or wedding, where everyone can come together to help pack up the space and savor a few more moments together. The concept was to design a neat, comfortable folding chair that is easy to deploy and beautiful in its folded state so that it can be hung or displayed. The act of sharing a meal is well known to every culture, often equated with fond memories that rekindle the senses and encourage reminiscing of special moments with loved ones. Among the acts often unnoticed in a successful meal are the uncomplicated gesture of serving food, and tongs represent the hand when you help to serve one another. Connecting the form of a compass and the ingenuity of a simple lever, this tong is deceptively inconspicuous on any dinner table. Gabriel Tan is a designer working between Singapore, Barcelona and New York. 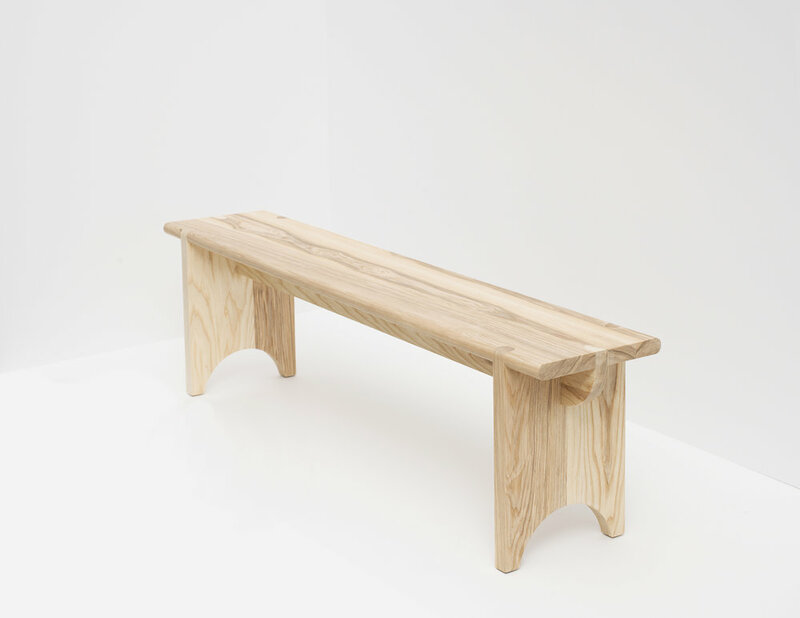 He is the principle of Gabriel Tan Design and co-founder of international design collective Outofstock, whose clients include Ligne Roset, Bolia, Scanteak, Biobu and Bla Station. Aside from his design work, he has taught as a visiting lecturer at Lasalle College of the Arts, the University of Oregon and also served as a jury member at the Cannes Lions awards.